In the southwest 'hillcountry' region of Texas, lies the powerful and sacred dome of Enchanted Rock. Visible for miles around, the impressive dome rises 1850 feet above sea level, some 450 feet vertically above base. Revered by the plains Indians for centuries, it spirals a potent electrical vortex. It is called the Ayers Rock of America. Enchanted Rock is indeed one of the most powerful points in the southwest, and holds a special relationship to Sedona, and indeed, Ayers Rock. The hillcountry region is in itself a very unique area in the 'heart' of south central Texas. A relatively small triangulated region, about 180 miles on each side, the hillcountry has a remarkably condensed energy field, notably higher in frequency than surrounding areas. This field creates a sense of well being. It is energetically fed by webbing of hydrolines and a major telluric leyline. The energetic field is roughly triangulated between Austin, Llano and San Antonio. It encompasses Kerrville, Luckenbach, Gruene, New Braunfels, Wemberley, San Marcos and Fredricksberg. The energy field is directly related to the higher quality of life and sense of well being that has drawn a number of intellectuals, artists and free thinkers to this area. The hill-country hosts the four largest Universities in Texas, the state capital, and a remarkable wine-growing region near Fredricksberg. Nearby Austin is continually ranked as one of the top five quality of life cities in the country, and hosts a sizable artistic community of musicians, writers and sculptors. The field is uniquely conducive to creativity. The Edwards aquifer is contained within the triangulated region. As such, an intricate underground webbing of rivers undulate their way beneath filtering limestone, spouting to the surface crystalline waters and springs. Granite and quartz outcroppings mark the rolling landscape between Austin, San Antonio, and Fredericksberg, and act as conduits for the leyline that surfaces in the hillcountry, from its source in the Yucatan. Several energetic centers exist within this charged triangle. The spiritual apex is Enchanted Rock. The plains Indians of southwest Texas held the lavender granite rock in awe. Its name, translated from the Tonkowa dialect, is 'Glowing, Singing Rock'. The dome does indeed make audible 'whale'moans at night, a phenomenon explained by the condensing of the rock layers, which cool rapidly after the warming sunlight fades into night. In periods of direct sunlight the surface of Enchanted Rock does appear to emanate visible energy waves, the heat on tarmac effect. Even more fascinating, is the green-bluish halo that seems to surround the dome just after sunset. This eerie glow that extends from one to five meters above the granite surface, immediately after sunset, is not folklore. The phenomenon is easily and regularly observed. The luminous effect has a brief frame time, which diminishes quickly as the rock cools. Scientist explain the glow as a solar heat radiation from the slightly radioactive granite. In other words, the rock is a giant solar battery transforming absorbed solar energy, however briefly, into light as it is released. 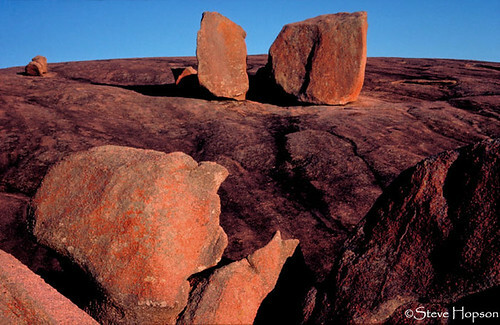 Enchanted Rock appears on first view, as three granite domes lying side by side. The fact is that the three domes are actually the obtrusive portions of one massive lava flow. The three are not just connected, but are part of the same rock. The geological nomenclature for Enchanted Rock is batholith, "an underground igneous rock formation, revealed by erosion." The Enchanted Rock batholith covers 100 square miles, some1650 acres. It is the second largest natural dome formation in the United States, the largest being Atlanta's Stone Mountain. which is considerably taller. Texans, accepting second status to none, have found a way to give it top billing. They retort with a humor as dry as an armadillo's hand, that "Enchanted Rock is the largest dome in the United States… that doesn't have dead confederates carved in its side!" (Referring in jest to Stone Mountain in Georgia). Enchanted Rock is geologically exquisite regardless of comparative mass… besides, I have always supported the theory that size doesn't matter! Back to business, the specific geometry of the dome shape itself is conducive to the spiraling energy pattern. Granite domes do appear in other areas of the USA (and world), and without exception, they create a potent energetic field. In most cases they have been recognized and worshiped by the ancients. I have spent many 'contemplative' moments on Enchanted Rock, and have connected with the spiritual entities that abide there. They are numerous. Enchanted Rock's three domes have characteristics unique unto themselves, but all three are components of the one circulating energy. The largest dome, Enchanted Rock, is female in individual aspect. She is the mother, the nurturer. She feeds energy to the other two domes, which balance and anchor her. The combined energies blend and swirl in a clockwise pattern. The two lateral domes, 'Little Dome' on the west, and 'Freshman Dome' on the east are both male in frequency, and triangulate with the mother to form a powerful electrical vortex. The energy of Enchanted Rock resonates to the 5th center, the throat chakra…fitting for the 'Singing' Rock. Enchanted Rock is part of the Llano Uplift, one of the oldest granites in the world, 1.1 billion years old! A portion of the batholith is metamorphic, and holds a condensed crystallized pattern. The fact that the enchanted dome is compromised of granite is quite significant. Granite both stores and radiates energies. Granite is composed primarily of feldspars and quartz…and significantly traced with potent pegmatite. Pegmatites are veins of crystallized minerals that form during the cooling of the magma that can vary from tourmaline, topaz, beryl, amethysts, snow quartz and citrine. The pegmatites of the Llano Uplift have housed some of the most unique crystals and rare earth minerals known to man. Burnetts Hill, located quite nearby within the granite of the Llano Uplift, has been found to 'glow' green, due to rare radioactive minerals such as gadolite. Enchanted Rock contains veins of crystallized quartz in several varieties that contain huge crystals up to 2 feet in length. Fluorite and beryl are also found in the dome. The properties of these powerful gems add tremendously to the energy of this site. The keeper of the rock is an ancient Native American entity, who resides there in spirit as a guardian. He is a compassionate protector soul and has indeed remained there through many centuries. He did not choose to depart with the 12:12. He revealed his name as Windsong. He passed into spirit through an accident on the rock, and has remained. His presence is strongly felt on the apex of the mother dome. He stays to balance influx of human energies, and to offer protection to those as they walk up and down the steep dome. His presence is that of a young, vital energy, deeply compassionate. Another powerful presence is found in the cave on the northwest face of the dome. An older, more ancient guardian spirit resides in this energy. The cave is the root center of the site, and houses a raw, primordial energy…a fire energy, kundalini. It is a powerful, intense enclosure. The cave is said to lead inward to a crystal cave in the center of the dome with massive crystals of many varieties. It has been the site of initiations, vision quests and ceremonial rites. A potion of the spiraling vortex energy re-enters the dome through the cave, and is spiraled up and outward at the top of the mother dome. The principle portion of energy flows into Enchanted Rock from underground, via the telluric energy flow of the Mayan Leyline. This energy is spiraled upward into all three domes. The primary conduit and receiver is the perfectly shaped mother dome of Enchanted Rock. The telluric energy is combined with the solar energy stored into the granite and amplified further by the quartz and pegmatite crystals. Once the energy is sprayed atop the domes, it enters the vortex cycle and gradually diffuses outward on all sides. The perimeters of the 'electrical' vortex then incorporated the hydroline 'water' energies from the surrounding streams, springs and lake. The dome is bordered on the south and west by a small clear stream that forks and cascades in shallow silver ribbons over the granite baserock. A small spring fed lake lies at the western face. The stream is lovely and forks into three smaller brooks, depending on the amount of rainfall. There are several magnificent faerie dens created along the brooks path as they bubble their way between jagged boulders at the base of the domes. In springtime the grounds are awash in bright Texas wildflowers. Bluebonnets, red Indian paintbrush, orange pots and bouquets of yellow coreopsis blanket the campgrounds, trails and streamsides in vibrant colors. The site literally becomes a canvas of southwest art. Bright flowers among red laterites, green cactus, knarled mesquite trees and powder blue skies. Eye candy! Two major trails wind their way up to the summit of Enchanted Rock. One base trail winds 4 miles around most of the entire base within the park grounds. The other trail goes steeply, to the summit. Both are definitely worth the effort. The summit trail is a 45minute walk. Mesquite trees and cacti grow in huddled bunches along the flower sprinkled trailside up until the lower portion of the bald granite dome is reached. Suddenly, the ascent is inclined granite dome, quite steep. Extreme caution must be exercised when traversing this unforgiving trail. Granite on the angled incline of the dome can be slippery even when dry, and extremely treacherous when wet. An ankle or knee can be badly injured with a twist or fall. All three of domes hold magical energies and pockets of condensed fields. There are a variety of focal points created by crevices, crystal veins and overhangs that are a pleasure to visit. Huge rectangular monoliths, broken off by lateral cleavage and erosion, stand like giant guardians and stonehenge replicas. All are very inviting, and very special. A beautiful variety of orange lichen covers portions of the rock. 'Moon pools' of trapped rainwater create beautiful floral gardens in sections of the top. A tiny rare brine shrimp, a relic of ancient times when this area was covered by ocean, comes to life when these garden pools occur. Depending upon ones available time at Enchanted Rock, there are many power places to explore and visit. The focused energies are tangible, and discovered throughout the park. However, the single most powerful energy is found on the 'Summit'of Enchanted Rock dome. The energy here is a virtual fountain of electricity. 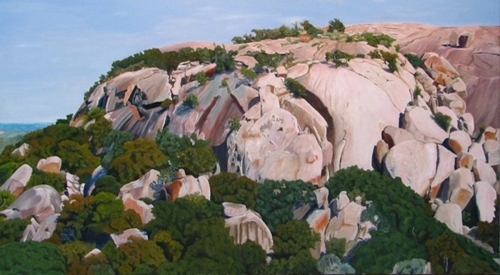 The summit is pitted, stark rock, flat pink granite. It is a 'Marscape', the size of two football fields. Somehow a lone tree manages to grow out of bare rock in the center. This is the apex. The tree is sacred, sustained by the fertile energies pulsing from the dome. Any spot chosen within 30 meters of the tree is in the powerful fountainhead. Here one is invigorated by a tingling flow of gushing white-blue energy. One is washed in a ley-fed outflowing vortex. Extreme meditative states are easily reached. Physical stamina and vitality are heightened. Chakras are balanced. Hearts are healed. >While the entire area abounds in special energetic sites, which correlate to all the major chakra centers…none match the pure power, energetic healing of the summit apex. In fact, I found the summit to correlate simultaneously to the crown, third eye and throat centers…depending on the exact spot chosen, as well as the time of day. The inner most portion is the crown, within 10 meters of the apex tree, moving outward over the next 15 meters, the third eye is stimulated. From 25 meters, to virtually the curving sides of the dome, the 5th chakra resonates. I also discovered that sunlight activates certain portions of the dome when it shines directly on its curved, indented surface. Certain pockets on the summit are creviced and scooped into perfect little reclining chairs, complete with granite backrests. The energy within these indentations is concentrated, and allows ones body to be immersed into an energy bath. Enchanted Rock is now becoming recognized as a major emerging energy site in the ascension of the new earth. Lightworkers such as Lakota master, Adam Yellowbird have been drawn there in recent years to anchor in the energy of the ascension portal that now flows into the vortex. Enchanted Rock is connected to the energy of Ayers Rock through this portal. Enchanted Rock is connected to Sedona through the triangulation of the Mayan leyline. This line emerges from the Yucatan Peninsula, undulating in and above the ground, up to Monterey, Mexico. There the energy splits, with the main body continuing upward to Sedona, the other portion coming up through San Antonio into the hillcountry. The Mayan line in the hillcountry has fissure lines from the main body that feed Austin, Wemberley, New Braunfels and Fredericksberg. The two lines converge again at Monument Valley. The aquifer energy of the hillcountry also has a complex synergy with the ley energy. The hydraulics from the aquifer has a strong, benevolent effect on the overall energy field of the region. The two energies, hydro and ley, form a six-pointed star, an evidence of sacred geometry in the living landscape. The principle points of the hydro energy lines are the Aquarena Springs in San Marcos, Founders Park Springs in New Braunfels and Barton Springs in Austin. Enchanted Rock is a one-hour drive from Austin. It is located 18 miles north of the wine region, resort town of Fredericksberg, along ranch road 965. A five-dollar fee is charged for entrance to the State Park. Over 50 campsites are available. The park is normally full on weekends, and the summit can be quite busy. I recommend carrying earplugs, (for meditation privacy) and extra jacket and water when going to the summit. The top is almost always windy, and the hike up, quite tiring. In the summer the heat is a factor. The times best for meditation is at sunset, or sunrise. The top is less frequented during these periods, and solitude is not interrupted. Some spectacular colors and energies emerge at both sunrise and sunset. Colors and lights that resonate well with the enchantment to be found on this magical rock. The 'glowing' phenomena of the quartz can be experienced after sunset on a sunny day. It is a unique characteristic of the dome. I have had some deep and wonderful experiences mediating atop Enchanted Rock from sunset into moonrise. Enchanted Rock summit under a full moon is simply magic. Be sure to descend slowly, and carry a small light. Windsong will help you down.